Peanut is an eight-year-old black and white smooth coat male Jack Russell terrier who weighs about 15 pounds. A family member was a breeder. 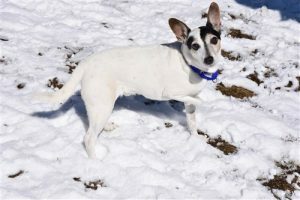 Peanut had been someone’s very special Jack Russell his entire life until his elderly owner took ill and had teams of nurses in his home 24 seven. Peanut could not adjust to the mayhem, was barking at all of the people and was getting nervous with all the commotion and the staff asked that the dog be removed. A family member came and brought Peanut to the MSPCA and they then reached out to us for help. We gladly agreed to take this wonderful little JRT who has obviously been through so much in the last few months, hoping to find his one special human once again. Peanut has a deformed front right paw, that he takes no notice of, walks on three legs but uses his paw as a balance when standing or sniffing. The assumption is he was born this way. A wonderful personality once he knows you, his main goal is just to be with you, snuggle, and play with his very special lobster squeaky toy. It is very apparent that Peanut was used to living with someone who was home a lot of the time as he desperately seeks his person when no one is around. He is very content just to sit with you or look out the window, but he certainly wants the company of his person close by. Peanut is housetrained; he does well in a crate, rides nicely in the car and was perfect at the vet. Peanut had a major dental and his smile now shows his pearly whites. Peanut loves to chase the ball despite his infirmity; he just does not bring it back but loves to run around having zoomies in true Jack fashion and enjoys short walks. An extremely smart little dog, this is one Jack Russell that listens attentively when you speak with him. Peanut does not like other dogs, he was never ever socialized, and even though they can be around him, he cares not to engage or barks madly at them. 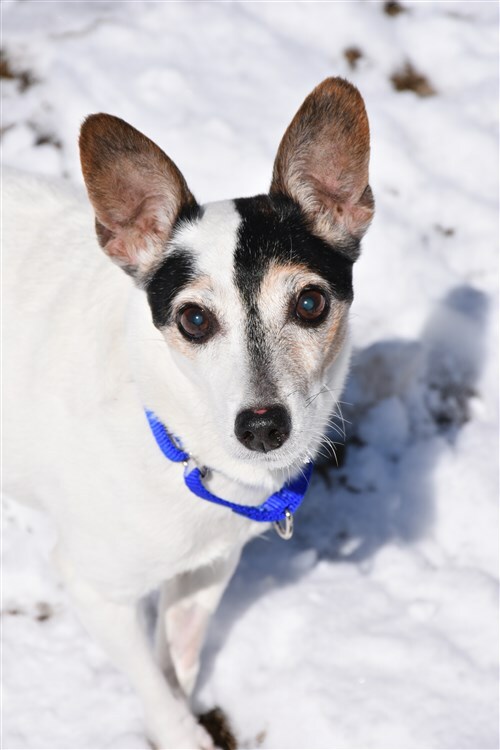 A very special Jack Russell, an adorable little boy is just seeking an adopter who will love him again and show him that there are still many years ahead to enjoy companionship.